2018 March CEO Report: 341 First Quarter CEOs, Highest Since Q3 2014 | Challenger, Gray & Christmas, Inc. Although the 96 Chief Executive Officers who left their posts at U.S.-based companies in March was a 15 percent drop from the 113 CEO exits in February, this is the highest quarterly total since the third quarter of 2014, when 348 CEO changes were recorded, according to a report released Wednesday by global outplacement consultancy and executive coaching firm Challenger, Gray & Christmas, Inc. The first quarter of this year saw 341 CEO changes, up 16 percent from the 294 CEO changes tracked in the final quarter of last year. This year’s total was up 13 percent from the 301 CEO exits in the first quarter of 2017. 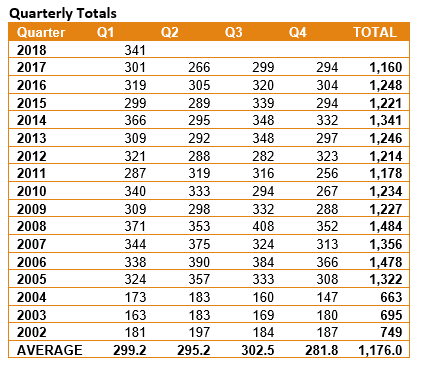 This is the highest quarterly total since 348 CEOs left their posts in the third quarter of 2014 and the highest first quarter total since 2008, when 371 CEO exits were recorded. “The growth we’ve been seeing in the last few months does not seem sustainable in the long term. In fact, we only added 103,000 new jobs in March, according to the Bureau of Labor Statistics,” said Andrew Challenger, Vice President of Challenger, Gray & Christmas, Inc.
“As wages grow and unemployment hovers near 4 percent and with the implementation of new tariffs and Wall Street reactions to the same, companies may be preparing for a readjustment in the markets, which may mean new leadership,” added Challenger. So far this year, women have comprised 23.7 percent of all CEO replacements. That is compared to 19.7 percent of CEO replacements in the first quarter of 2017 and 18 percent of CEO replacements in all of 2017. The Government/Non-Profit sector continues to lead all industries in departures, with 64, 19 of which occurred in March. Computer companies announced 40 exits so far this year, with 11 last month. Health Care/Products firms have announced 36 CEO exits in 2018, including ten in March. Financial companies reported 34 through the year. Most CEOs (104) left their posts due to retirement, while 103 have stepped down into other positions within the company, usually as a Board Member or other C-Level executive. Another 47 resigned their positions. Three CEOs left due to scandal so far this year, while another three were fired from their roles. California companies saw the highest number of CEO changes this year with 37, six of which occurred in March. Companies in Texas saw nine departures last month, while Illinois reported seven.